I put these little munchies together based on some potatoes I made for dinner the other night. 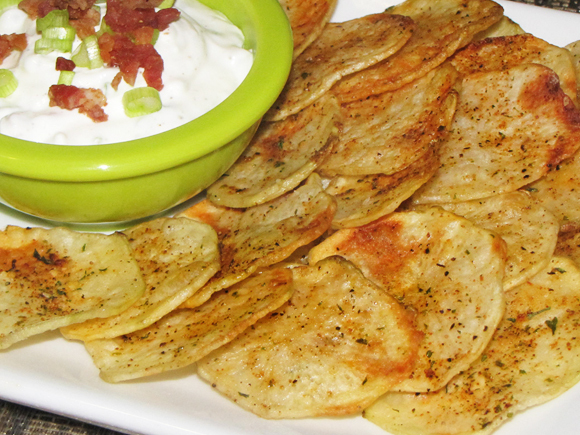 Those dinner potatoes were similar to the following recipe, but more like a side dish rather than a snack. They were also served plain while these snack-size bites come with a dip. The inspiration for this idea came from my sister. I suggested a crispy potato for a snack/appetizer idea and showed her the ones I made for dinner. We decided that they weren't up to the task of being a snack because of the thickness though, so I revamped them slightly for a more party-worthy appeal. These potatoes are crispy, light and definitely good for munching on while watching, hmmm, say...a Super Bowl. The 'chips', with a little kick, are served with a dip that is very reminiscent of a baked potato topping. I baked the sliced potatoes instead of frying them to make a healthier alternative to the standard bagged versions and they're even a little better than those because they're made with a little cooking spray instead of being doused in oil. You can also feel a little better about the dip by using low-fat or fat-free ingredients and just a hint of bacon for some flavor. Of course, they're excellent without the dip, but it's nice to have options! 2. Slice the potatoes into 1/8" rounds using a mandoline or other slicer for even cuts. 3. Spray a foil-lined baking sheet with enough cooking spray that the potatoes won't stick. 4. Line the potatoes in a single layer. 5. Mix remaining ingredients and sprinkle over the potato slices. 6. Give the potatoes a quick spray with the cooking spray so they don't dry out too much. 7. Bake them for 15-18 minutes or until golden brown. Be careful not to burn them. Take out any that start to brown before others so they don't burn.